If you're suffering from gout, a form of arthritis characterized by painful and tender joints caused by uric acid build up and inflammation, you've probably researched effective remedies and may have heard about cherry juice as an option. To help relieve symptoms of gout, it's important to know if cherry juice is an effective treatment, and how much you should take. There aren't official recommendations for how much cherry juice you should drink to alleviate gout, but consuming at least one serving of cherries daily may reduce gout attacks. A 2012 study found getting three servings of cherries or cherry juice within a two-day period is effective for gout relief, and describes one serving as 1/2 cup cherries (10 to 12 cherries). The Arthritis Foundation notes that one 8-ounce bottle of tart cherry juice equals about 45 cherries. Another study published in 2014 found that ingesting 30 to 60 milliliters (2 to 4 tablespoons undiluted) of Montmorency tart cherry juice concentrate lowered inflammation and uric acid, a major contributor to gout attacks. There are several factors that may explain effects of cherry juice on uric acid and gout symptoms, but the exact reason is unclear, according to a 2010 study published in the International Journal of Nephrology and Renovascular Disease. The Arthritis Foundation reports cherries and cherry juice may relieve symptoms of gout because cherries are rich in plant pigments called anthocyanins, which are powerful antioxidants with anti-inflammatory properties. Mayo Clinic notes that vitamin C, abundant in cherries and often present in cherry juice, may reduce uric acid in your blood, but more research is needed demonstrating vitamin C's effects on gout. Which Cherry Juice Is Best? Many different types of cherries and juices are available, which might make you wonder if one is superior over the others, or if juice is better than whole cherries. While more research is needed in this realm before making specific recommendations, tart cherry juice and tart cherries are commonly used in studies examining gout relief strategies. The Arthritis Foundation suggests tart cherries, such as Montmorency cherries, and tart cherry juice may be the best options. Cherry extract is also available and appears to be effective for gout flare-up reduction. The Arthritis Foundation says taking 1 tablespoon of tart cherry extract (equivalent to 45 to 60 cherries) two times daily for four months reduced gout flares by 50 percent in one study. 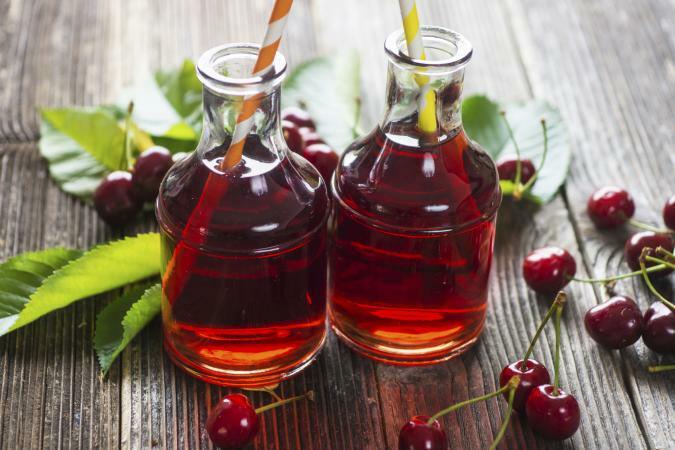 When deciding whether to drink cherry juice for gout relief, it's important to weigh the pros and cons. If you're seeking a natural gout remedy without side effects associated with medications used to treat gout, cherry juice may be a good fit. Cherry juice contains healthy antioxidants and is often rich in vitamin C, which is beneficial for gout patients. However, cherry juice may not relieve symptoms of gout as effectively as medications, and it doesn't relieve pain associated with gout. Cherry juice is often high in sugar and calories but contains little or no dietary fiber, which isn't the best choice for healthy weight management. In addition to cherries and cherry juice, several medications and other treatments are helpful when you have gout. Mayo Clinic reports that anti-inflammatory drugs, pain relievers, corticosteroid medications, and drugs that block uric acid production or improve uric acid removal are often prescribed for gout patients, and coffee and vitamin C supplements may lower uric acid levels in your body. MedlinePlus says certain lifestyle changes may help prevent gout attacks. These include limiting alcohol, maintaining a healthy weight, exercising daily, limiting added sugar and sugary drinks, reducing red meat intake, and eating a healthy, well-balanced meal plan rich in fiber. If you suffer from gout flare-ups, check with your doctor to determine which treatment is the best option for you. Cherries and cherry juice may be a good first line of defense for flare-up prevention, but they shouldn't take the place of a healthy lifestyle and medications if your gout is severe.